NASHUA, NH--(Marketwired - Oct 15, 2013) - Autauga County will be the first county in Alabama to deploy ping4alerts! The Autauga Emergency Management Agency, Autauga 911, Autauga County Sheriff's Office, Prattville Police and Fire Departments, and Mayor Bill Gillespie's office will utilize the mobile communications platform to instantly notify citizens of public safety concerns. "This County had a need and after assessing several solutions, ping4alerts! was the most feature-rich, allowed multiple agencies to use it concurrently, and was the most cost-effective," said Autauga EMA Director Ernie Baggat. "We are especially proud to be the first agency in the State of Alabama to implement this service." Ping4alerts! is a free iOS and Android app that uses the latest-location-based technology to deliver a notification to mobile devices within a highly localized area. Through a web-based application, Autauga County EMA can draw a shape on a map as small as a street block or as large as the County to push an emergency notification to the space inside the geo-fence. Ping4 Inc. respects user anonymity and does not require a person to provide any personally identifiable information (phone numbers, email address). Ping4alerts! delivers the targeted alerts over the Internet through GPS, cellular, and available Wi-Fi networks. "Autauga County and the City of Prattville are the big winners here," said Mayor Bill Gillespie, Jr. "This app will give us the ability to push out notifications to our citizens through their mobile devices. Ernie has made this possible and we appreciate his efforts and those of his staff." Ping4 Inc. delivers rich media alerts that can include images, custom audio, video and mobile web links. These features coupled with the platform's precise accuracy, insure public safety, information is targeted, instant and, above all, relevant. 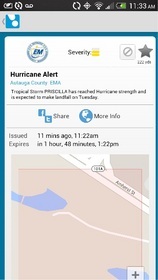 "Ping4 Inc. has been implemented throughout the United States and we are excited that Autauga County will be the first in Alabama," said Jim Bender, CEO of Ping4 Inc. "Imagine stepping onto a beach or coastal recreational area and getting an alert informing you of current conditions or local regulations. No other product can deliver location specific content the way ping4alerts! can. Ernie Baggat is forward-thinking individual and has been proactive in promoting ping4alerts! to other counties within Alabama." Citizens are encouraged to download the ping4alerts! app by simply visiting the Google Play or iTunes store. Autauga County EMA has stated that monthly alerts for weather siren testing will be utilized to keep users engaged in between public safety events. Ping 4 Inc., is a Nashua, New Hampshire software company utilizing the latest in push technology to deliver real-time, location-based, multimedia alerts to any iOS or Android mobile device. Public safety agencies license the platform to keep citizens informed of extreme weather events and other fast-moving situations. Consumers are not required to give up any personally identifiable information. User identity is 100% protected. More information is available at www.ping4.com. About this company Ping 4, Inc.